Community Center 850 Pomona St.
First Monday of each month, 7:00pm at the Community Center. Sheriff and Highway Patrol attend this meeting. 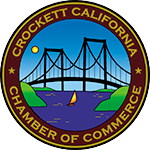 If you have concerns or questions about what goes on in Crockett, this is the meeting to attend.